I would like to start adding reviews of books I've read that are related to weight loss, nutrition, emotions, clean eating etc as it seems I've been reading a lot of them lately! 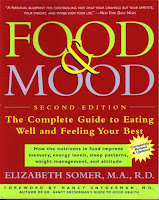 I found Food & Mood by Elizabeth Somer on a total whim. 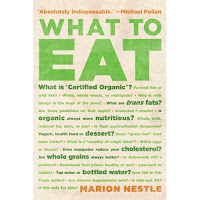 I like to hang out in the food/health section of my local bookstore and started reading this book in the store. I thought it would be a great read for me personally, but would provide some additional insight for leading my meetings. The basic gist of the book is how our mood effects our eating habits. Sounds simple, right? Not when you factor in stress, PMS, general fatigue, SAD and many other issues we face as humans. It provides insight on each factor and gives you ideas for combat including tips and recipes. It helps you to look at your diet and see how your food choices can really affect your mood. A really interesting, relevant book. Once again, I was browsing at the bookstore when I came across this book and then found it at the library. Lately I've been a lot more cognizant of my choices in life and how they relate to the environment. Some people think I'm going a little nutty or say that I'm just standing on my environmental soap box, but I'm really trying to do what I can for the earth and help myself and my family at the same time. 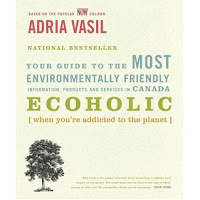 Your Guide to the Most Friendly Information, Products and Services in Canada is a great Canadian resource for people who are looking for ways to go green but (like me) need some guidance. Great information, products and resources and overall a really fast read. I took what I could from the book and am now applying the principles in my daily life! Ashley, I hope allis well in your world and thanks for putting up the book reviews. i am always looking for new things to read on the treadmill.